Next Sand is based on a rare natural mineral that is highly processed and graded. nextsand is based on a rare natural mineral that is highly processed and graded. It’s unique properties allow it to radically alter the performance and cost of media filtration. 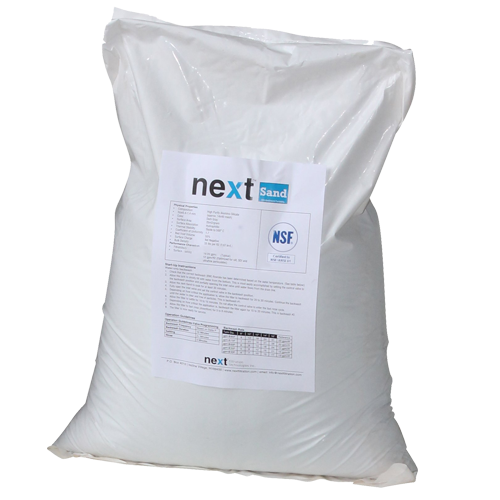 The hardness, stability and microporous character of nextsand makes it a perfect filtration media for virtually every application in the water and wastewater treatment industry. High capacity filtration throughout the entire nextsand bed depth provides more than twice the capicity of multimedia filtration. High low 3-4 times that of multimedia with superior filtration. Long Lasting media (>5years) not consumed in the process. Simple periodic backwash keeps the media clean and operating efficiently. RO Pretreatment – Superior SDI reduction. Cooling Towers – Uneaqualed Turbidity removeal. Minicipal Water Treatment, pressure and gravity filters – highers flow, lower pressure drop and superior filtration performance.